Andrew Braham, 17, says he is facing expulsion for BEING CALLED a gay slur, not for saying it himself. 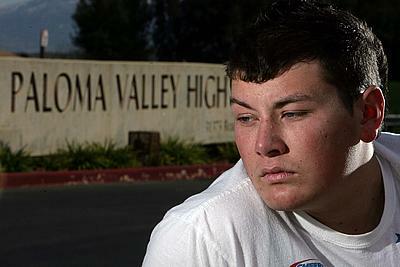 Paloma Valley High School is under investigation by the ACLU, the granddaddy of “You did WHAT now? !” establishments after a laundry list of incidents involving discrimination, homophobia, and ineptitude on the staff’s part. Students were prevented from participating in National Gay & Lesbian History Month, the victims of bullying are being disciplined rather than their harassers, and in one case, a teacher even wrote an “S” for sinner on a student’s hand. Uh…except it sounds like you don’t at all. The ACLU doesn’t get involved with institutions that are doing an outstanding job of protecting American Civil Liberties all on their own. The school says the teacher was “dealt with,” not fired. Students say the scarlet letter teacher struck more than once. Additionally, a student who argued back after being called a gay slur was suspended two separate times, while his assailant went unpunished. Students say they are the victims of hate crimes on school grounds that teachers and administrators refuse to do anything about. Wowzers. It sounds like Paloma Valley High School needs to check itself. We’re so glad that students felt empowered enough to launch formal complaints and call upon the ACLU to protect themselves from a school that obviously is failing to do so. This situation should (But won’t if any of the myriad of schools in similar hot water for failing to protect their students from harassment is any indication) open the eyes of teachers and administrators across the nation. The jig is up. Do your job! We’re horrified at the scarlet letter teacher, and Paloma Valley High School’s continued employment of the jerk. Thoughts?